and took us girls to the valley as Laura wanted to see the girls about some thing. I got supper over and did the evening work after coming home. Thursday August 23rd 1894 I got my work done up and the boys dinner fixed and Laura and I went in to Hatties big quilting party to which all the girl cousins were invited. I helped some about the dinner. We had a very nice time. It was a big undertaking. I never could have got through with it so well. Laura stayed all night. I did not get home till nearly seven oclock. Will had a fire and I soon got supper. 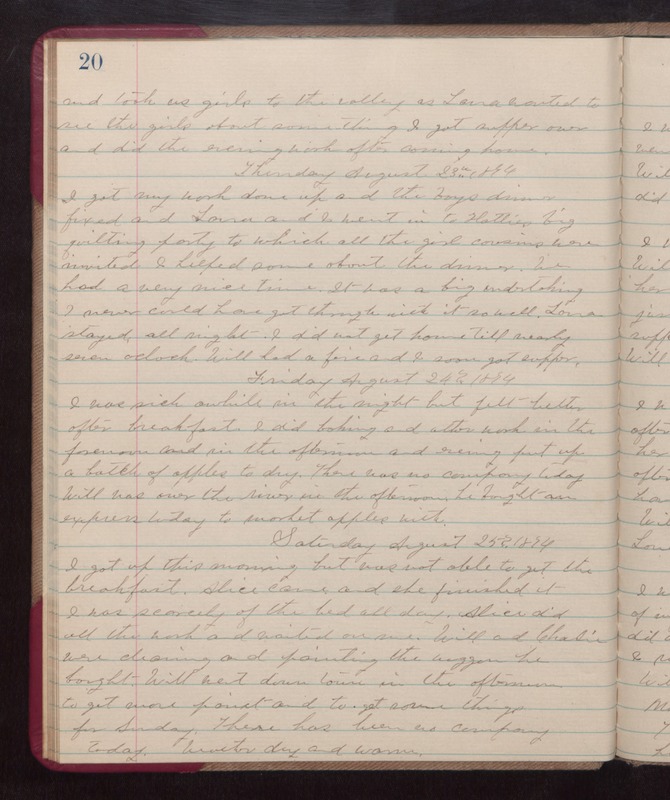 Friday August 24th 1894 I was sick awhile in the night but felt better after breakfast. I did baking and other work in the forenoon and in the afternoon and evening put up a batch of apples to dry. There was no company today. Will was over the river in the afternoon. He bought an express today to market apples with. Saturday August 25th 1894. I got up this morniong but was not able to get the breakfast. Alice came and she finished it. I was scarcely of the bed all day. Alice did all the work and waited on me. Will and Charlie were cleaning and painting the waggon he bought. Will went down town in the afternoon to get more paint and to get some things for Sunday. There has been no company today. weather dry and warm.